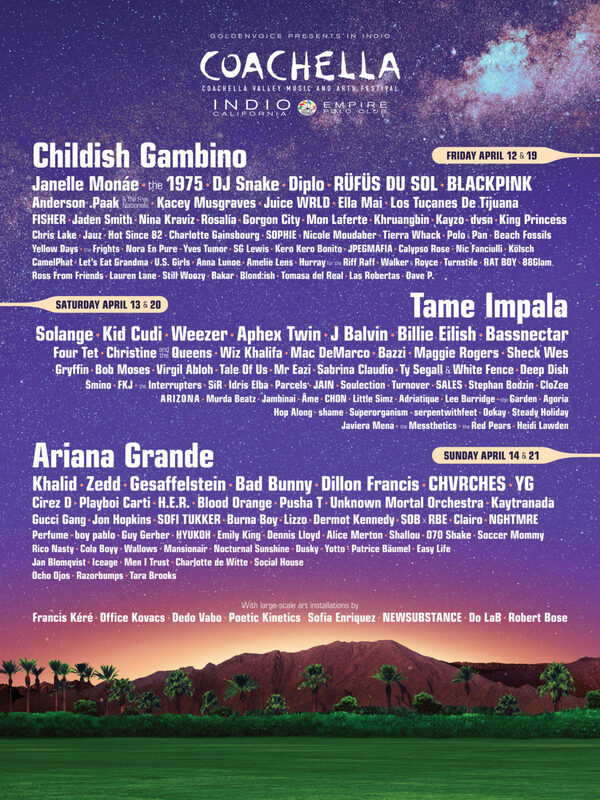 Childish Gambino, Tame Impala and Ariana Grande lead the lineup for the Indio, Calif., Coachella Valley Music and Arts Festival 2019, as announced by organizers Goldenvoice late Wednesday night. The two-weekend West Coast fest is set for April 12-14 and 19-21. 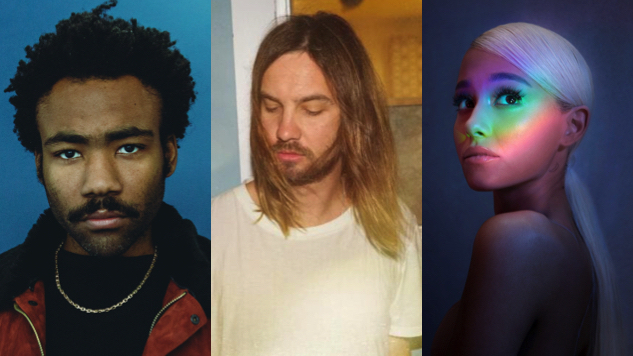 This year’s headliners offer plenty to be excited about: Donald Glover, who took 2018 by storm with his instant-classic single “This Is America,” is still prepping what will be his final album as Childish Gambino. Tame Impala, too, have a new album on the way—upon the fest’s lineup announcement, frontman Kevin Parker took to Instagram, writing, “New year. New shows. New sounds.” And Grande, Billboard’s 2018 Woman of the Year, will follow up her acclaimed 2018 release Sweetener with a much-anticipated LP reportedly titled Thank U, Next. Below the top line, Coachella’s characteristically massive lineup features the artists behind some of 2018’s most acclaimed albums, from Janelle Monaé and The 1975 to Kacey Musgraves and Pusha T. Right alongside them are acts including Anderson .Paak & The Free Nationals, Solange, Weezer, Aphex Twin, Soccer Mommy, Khalid, Billie Eilish, J Balvin, Mac DeMarco, Unknown Mortal Orchestra, Kid Cudi, CHVRCHES, Blood Orange, Maggie Rogers, Charlotte Gainsbourg, Y.G., U.S. Girls, Rosalía, Tierra Whack, Ty Segall & White Fence, Hurray for the Riff Raff, Kero Kero Bonito, Iceage, Parcels, Hop Along, Shame, JPEGMAFIA, Superorganism, Christine and The Queens, serpentwithfeet, Kaytranada, Lizzo, Beach Fossils, Jon Hopkins, SOB x RBE and more. And buried in the lower lines of Saturday’s acts is none other than actor Idris Elba, who, in addition to looking the way he does, is also a DJ. We get it, man, you rule! One artist who won’t be appearing, though: Kanye West. TMZ reports that negotiations for the rapper to headline the fest fell apart after West insisted that Coachella’s traditional stage size was “artistically limiting.” Goldenvoice reportedly wouldn’t budge, prompting West (who has employed floating stages on recent tours) to walk away. Find the complete festival lineup below, beneath Childish Gambino and Tame Impala performances from the Paste archives. Coachella passes go on sale this Friday, Jan. 4, at 2 p.m. ET.